Trimed® Flu is the “Optimal Synergistic Combination with Programmed Priming Release for…Sinusitis…Allergic rhinitis and Common Cold & Flu Cases". Pack: A box of 2 strips each of 10 tablets. Sinusitis: Air trapped within a blocked sinus, along with pus or other secretions (liquid material) may cause pressure on the sinus wall. The result is the sometimes intense pain of a sinus attack. Similarly, when air is prevented from entering a paranasal sinus by a swollen membrane at the opening, vacuum can be created that also causes pain. Allergic Rhinitis: Allergic rhinitis is a chronic immunoglobulin E–mediated (IgE-mediated) inflammatory disease of the nasal mucosa, a condition that mimics a chronic cold. Common Cold: A contagious, viral infectious disease of the upper respiratory system, caused primarily by rhinoviruses and corona viruses. Common symptoms include a sore throat, runny nose, headache, nasal congestion and fever. Inactive ingredients: Core starch, Hydroxypropyl methyl cellulose (2910), Dibasic calcium phosphate dihydrate, Stearic acid, Magnesium stearate, Polyethylene glycol 3350, Dye Opaspray white, Polyethylene glycol 400. Loratadine is a long acting antihistamine. Pseudoephedrine sulphate, is an orally active sympathomimetic amine which exerts a decongestant action on the nasal mucosa . Paracetamol is an effective and fast acting analgesic and antipyretic which acts centrally to relieve mild to moderate pain . Absorption : Rapidly absorbed from the gastrointestinal tract and is distributed throughout most body tissues. The plasma half-life is 1.25 to 3 hours, but may be increased by liver damage and following overdosage. Elimination : Principally by liver metabolism (conjugation) and subsequent renal excretion of metabolites . Absorption : Co-administration of loratadine and pseudoephedrine sulphate does not significantly affect the bioavailability of either component. Distribution : No plasma protein binding data in humans are available. Metabolism : 70% of the administered dose was recovered in the urine and 10% in the feces. Elimination : The mean elimination half-life of loratadine is 7.9 hours and the mean elimination half-life of pseudoephedrine is 6 hours. Indicated for the relief of symptoms of seasonal allergic rhinitis associated with moderate to severe pain. 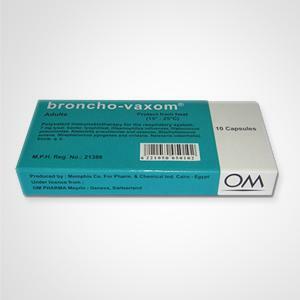 It is also indicated in sinusitis for the relief of sinus pain, congestion & fever. DOSAGE & ADMINISTRATION: One tablet twice a day ( every 12 hours ). It is contraindicated in patients who are hypersensitive to any of its ingredients. This product, due to its pseudoephedrine component, is contraindicated in patients with narrow angle glaucoma or urinary retention, and in patients receiving monoamine oxidase (MAO) inhibitor therapy or within fourteen (14) days of stopping such treatment. It is also contraindicated in patients with severe hypertension, severe coronary artery disease, and in those who have shown hypersensitivity or idiosyncrasy to its components, to adrenergic agents, or to other drugs of similar chemical structures. Manifestations of patient idiosyncrasy to adrenergic include: insomnia, dizziness, weakness, tremors, or arrhythmias. Headache, insomnia, dry mouth, somnolence, nervousness, dizziness, fatigue, dyspepsia, nausea, pharyngitis, anorexia & thirst. No specific interactions studies have been conducted with loratadine, pseudoephedrine & paracetamol tablets. However, loratadine ( 10 mg once daily ) has been safely co-administered with therapeutic doses of erythromycm, cimetidine, ketoconazole in controlled clinical pharmacology studies. Loratadine, pseudoephedrine & paracetamol tablets (pseudoephedrine component) are contraindicated in patients taking monoamine oxidase (MAO) inhibitors, and for 2 weeks after stopping use of an MOA inhibitor. The antihypertensive effects of beta—adrenergic blocking agents, methyldopa, mecamylamine, reserpine and veratum alkaloids may be reduced by sympathomimetics. Increased ectopic pacemaker activity can occur when pseudoephedrine is used concomitantly with digitalis. Patients receiving CNS depressants such as anaesthetics, hypnotics, sedatives, tranquilizers and alcohol concomitantly with Loratadine, paracetamol & pseudoephethine tablets may exhibit an additive CNS depression. Barbiturates and prolonged alcohol ingestion may increase the metabolism of paracetamol to metabolites toxic to the liver . There are no adequate and well controlled studies in pregnancy. A decision should be made whether to discontinue nursing or to discontinue using the drug taking in account the importance of the drug to the mother. Trimed Flu tablets should be used with caution in patients with hypertension, diabetes mellitus, ischemic heart disease, increased intraocular pressure, hyperthyroidism, renal impairment or prostatic hypertrophy. Central nervous system stimulation with convulsions or cardiovascular collapse with accompanying hypotension may be produced by sympathomimetic amines. Trimed Flu tablets contain paracetamol, so caution should be taken when the drug is taken with other medications containing the same active ingredient. Trimed Flu tablets should be used with caution in patients with hypertension due to its pseudoephedrine sulphate content. Trimed Flu film coated tablets should be stored at temperature not exceeding 30 C.
Carton box contains 2 strips + inner leaflet. Each strip contains 10 tablets. Trimed® Flu is the "Optimal Synergistic Combination with Programmed Priming Release for...Sinusitis...Allergic rhinitis and Common Cold & Flu Cases". Can we score Trimed Flu tablet? Do not crush, chew, or break an extended-release tablet. Swallow it whole. Breaking or opening the tablet may cause too much of the drug to be released at one time. It can be taken up to 7 days due to the presence of Pseudoephedrine. 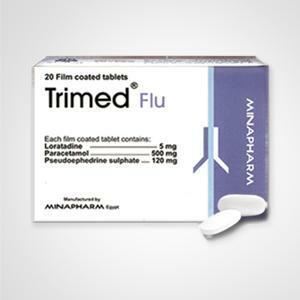 Trimed Flu tablet to be taken only twice daily due to the presence of Pseudoephedrine. Why do some patients experience insomnia? Insomnia is due to the presence of pseudoephedrine. This side effect is rare according to different patient variation. Risk Benefit Ratio: This side effect shows the efficacy of Trimed Flu. All Cold Preparation has Pseudoephedrine which has the same side effects, while Trimed Flu has Pseudoephedrine with proper concentration.